Preguntas frequentes How do I fix the black screen issue when capturing my PS4 through my capture card? How do I fix the black screen issue when capturing my PS4 through my capture card? Suporte > XSplit Broadcaster > Preguntas frequentes > How do I fix the black screen issue when capturing my PS4 through my capture card? In order to capture gameplay footage from a PlayStation 4 console using your capture card, you will need to disable HDCP (High-bandwidth Digital Content Protection). 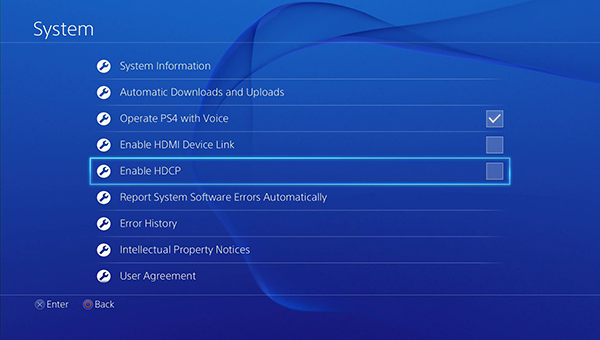 To disable HDCP on your PS4, go to Settings > System then uncheck Enable HDCP.